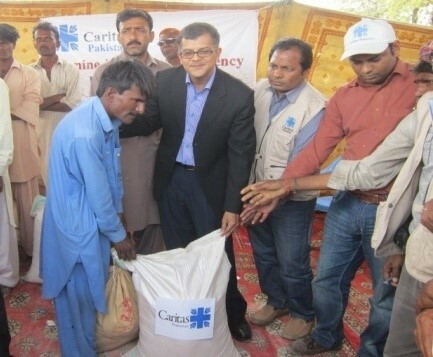 As Caritas Pakistan emphasized on extremely vulnerable groups for the provision of food package. 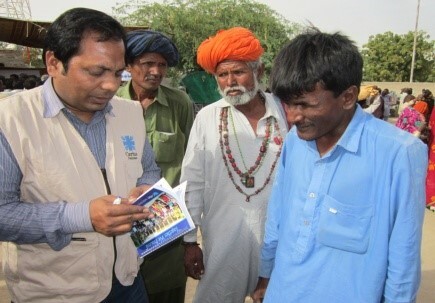 During the distribution of relief package today on March 12, 2014, we came across a young man who is blind by birth. We took time and had chat with him. Mr. Mol Chand s/o Rai Chand is 27 seven year old living in village Chitra, UC Adhigam, Taluka Nagarparkar, District Tharparkar. His three brothers and two sisters are married and living separately but he is the only one living with his parents. about them. When asked he explain that I am sad because I do nothing but lying on bed and used to play with my sheep which are no more. My parents are farmers but due to scarcity of water it has become a conditional business very often not useful enough. He further said that there is no well in the village but only a natural pond which is dried up now. He shared that “I was very excited when Caritas team reached my house yesterday and registered my name as one of the beneficiary of food package. Today I am happy to receive that package which will bring smile on face of my parents after few months. God Bless Caritas Pakistan for this.